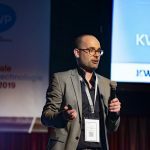 KWR presented the value added of water knowledge in water practice at Aqua Nederland Vakbeurs 2019. 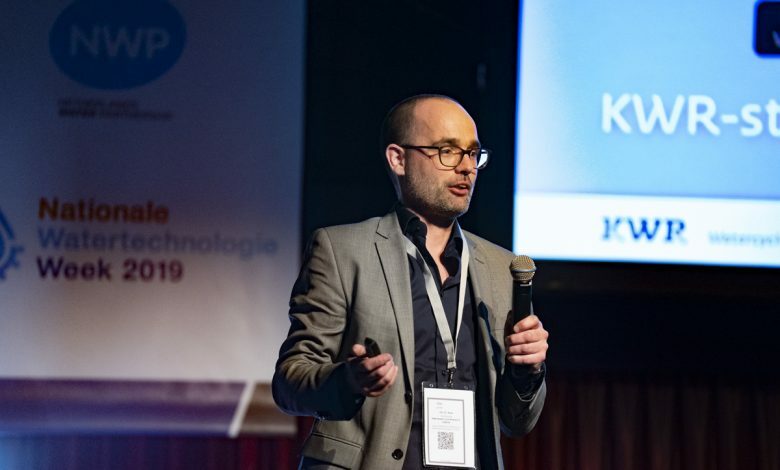 The event, which took place from 19-21 March in Gorinchem, was held concurrently with the National Water Technology Week, during which KWR researchers gave presentations on Legionella, sewage water, and water storage and reuse. On the last day of the trade fair, KWR organised a symposium titled ‘Developing knowledge for implementation in water practice’. KWR experts gave presentations on five different subjects. 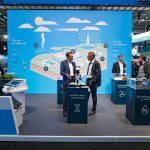 KWR’s stand at the trade fair presented several innovations and products in the areas of water quality, water treatment, water management and water technology. KWR strengthened its connections at the fair with collaboration partners from the water and associated sectors. Interested visitors got caught up in the research possibilities opened by the issues facing water practice. The stand visitors also had the opportunity to test their expertise by taking part in a quiz on water subjects. How much of an expert are you? Quiz questions at the Aqua Nederland Vakbeurs. You’ll find the answers at the bottom of this page. On 20 March, in parallel with the trade fair, the Industry Water Network Group met for the twentieth time. 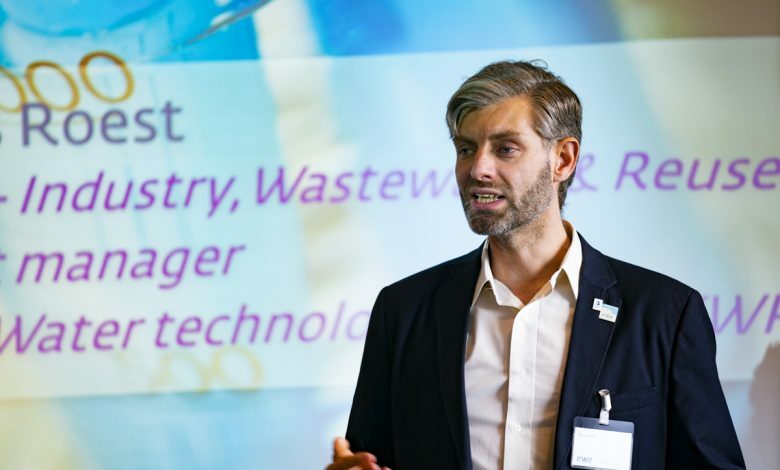 Through this network group, KWR’s Industry, Wastewater & Reuse team provides a platform for industrial stakeholders – for instance, a seminar was organised on the use of mobile treatments in industry. The presentations reflected the experiences in the industrial sector and the offerings of various suppliers. The sessions during the National Water Technology Week were organised around different day themes. The first day’s theme was ‘Is water still really so safe?, and Anthony Verschoor and Erik Emke spoke on Legionella and sewage water, respectively. The last day’s theme was ‘The city as autonomous ecosystem’. 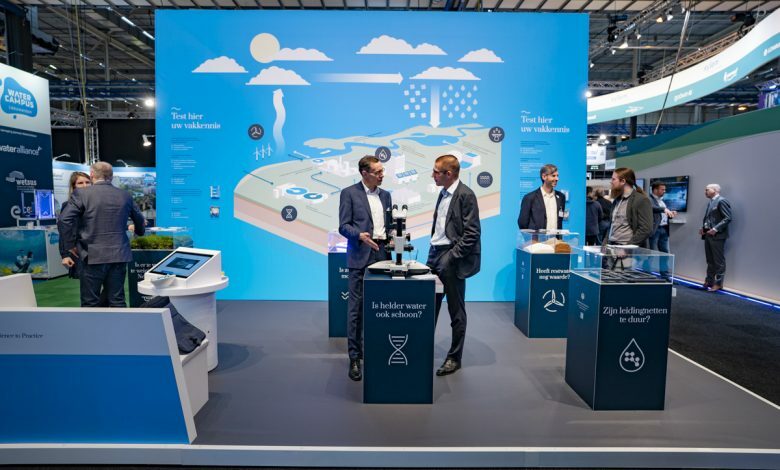 Various parties are working on the development of new water concepts that contribute to a circular and self-sufficient urban water system. KWR’s Marcel Paalman gave a presentation on the Spangen Urban Waterbuffer project. This project in Rotterdam, where the groundwater is brackish or saline, stores rainwater that falls on the roof of the Sparta stadium in the deep underground. The storage of excess water in the winter months contributes to flood containment while building a freshwater reserve, which can then be used to water Sparta’s football field. 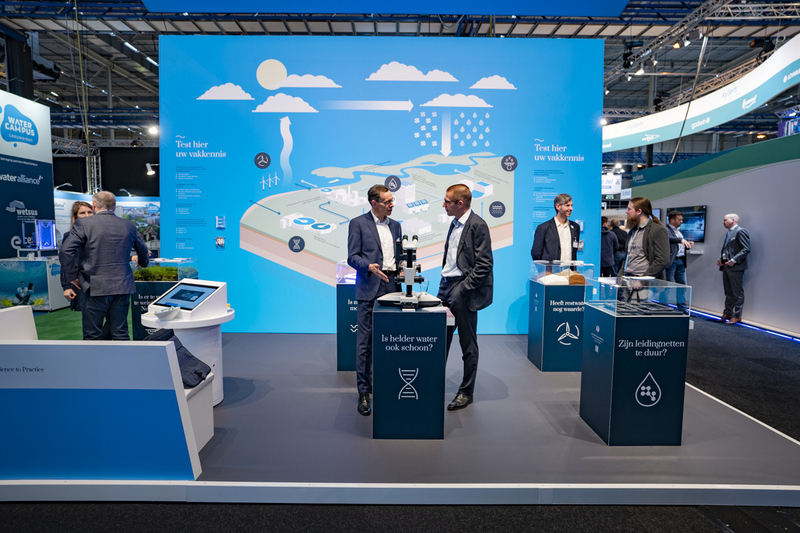 KWR’s Klaasjan Raat also demonstrated the importance of the subsurface as a link in a circular and self-sufficient water system, and Diederik van Buuren (Limburg Water Distribution company) spoke about the separation and use of wastewater streams in the city. On 21 March, the last day of the fair, KWR organised an interactive symposium on a range of subjects. 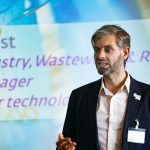 Peter van Thienen spoke about intrinsically smart water distribution systems, which are smartly designed and equipped with sensors and algorithms. 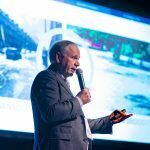 Professor Kees van Leeuwen spoke about water management and governance. The key water challenges that are concentrated in cities should be solved within the cities. The challenges can be tackled by means of practical collaboration and knowledge sharing – these are producing well-integrated urban water infrastructures in cities all over the world. 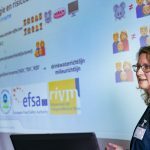 Milou Dingemans gave a presentation on the use of bioassays in water-quality effect-based measurements. A number of different applications were explained, as was the importance of correct choices for sample pre-processing, bioassay set selection, and results interpretation. Protocols and decision aids to this end are being developed within the Water Quality Knowledge Impulse programme. 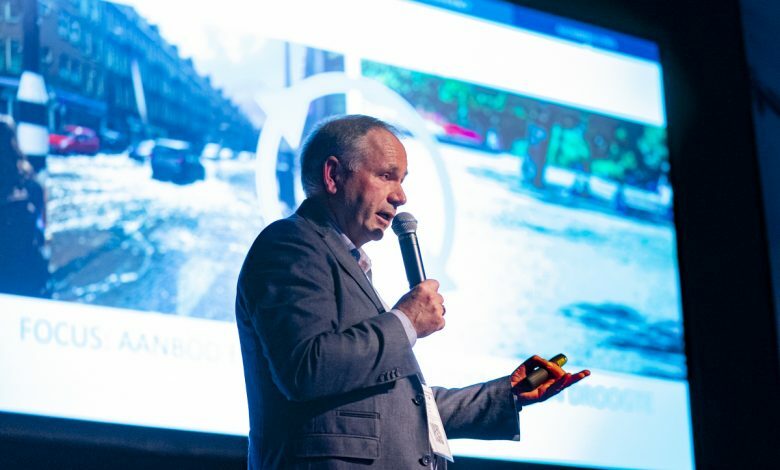 Kees Roest explained global water trends and specific developments in the Netherlands. For example, the TKI project, CoRe Water, which is a new wastewater treatment concept. CoRe Water involves the use of membrane filtration technology to produce clean water from sewage water, while also enabling a more efficient treatment of wastewater. Lastly, Ruud Bartholomeus spoke about effluent reuse and the use of the shallow underground. Among other things, he outlined the role of water in the circular economy. Drinking water can be produced from different sources. Which sources are used in the Netherlands? How much FRESH groundwater does the Netherlands have? Is crystal clear water safe to drink? A. Yes, because you don’t see any dirt. B. No, because safe water has to be a bit cloudy. C. You can’t tell: you need further measurement information. Which water is the most strictly controlled? A: Spring water and mineral water must meet the standards of the Commodities Act for packaged drinking water (minimum and maximum concentrations for 15 substances), and tap water must meet those of the Drinking Water Act and the Dutch Decree on Water Quality (65 substances). Therefore, it can happen that spring water or mineral water may actually be sold without meeting the drinking water standards. The fact that we, in the Netherlands, have large groundwater resources does not yet mean that we can abstract all this water without problem. Last summer it became clear that ditches and streams can dry up, and plants not get enough water from the groundwater system, if too much groundwater is abstracted. B: In the Netherlands we use both groundwater and surface water to produce our drinking water (the proportions are about 60% groundwater and 40% surface water). We could also produce drinking water from seawater, but we don’t do it. C: The fact that the water is crystal clear indicates, in any event, that there are few or no particles and/or coloured substances in the water. But the water might still contain poisonous substances (to start with, are you sure that it’s water?) or pathogens. C: The volumes of fresh groundwater in the Netherlands are huge: they’re estimated to be about 1,100 billion m3! These resources are located mainly in the south, centre and east of the country. Additionally, in the south-east of Brabant province, even more fresh groundwater has been found at depths below 600 m. Fresh groundwater is an important water source for water utilities, breweries and other industries that need freshwater. In the western Netherlands, groundwater is mostly brackish/saline. For this reason, drinking water is produced from fresh surface water and not groundwater. 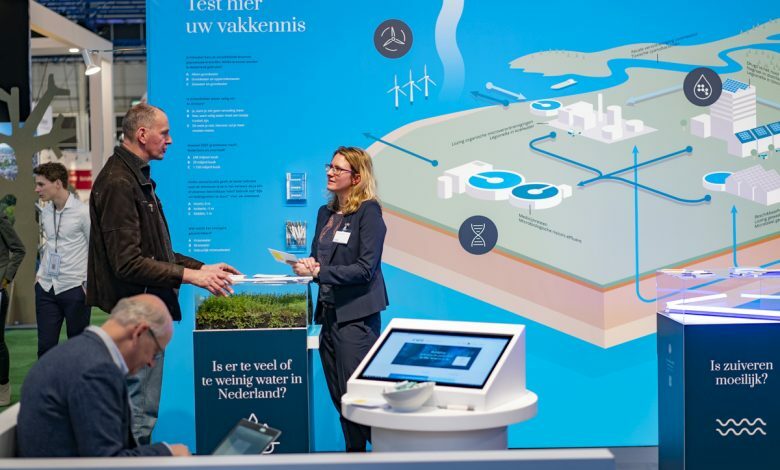 KWR’s stand at Aqua Nederland Vakbeurs 2019. Trade fair visitors take part in the quiz at KWR’s stand. Klaasjan on ‘Residual water as buffer water: future-resilient water supply for greenhouse horticulture’. 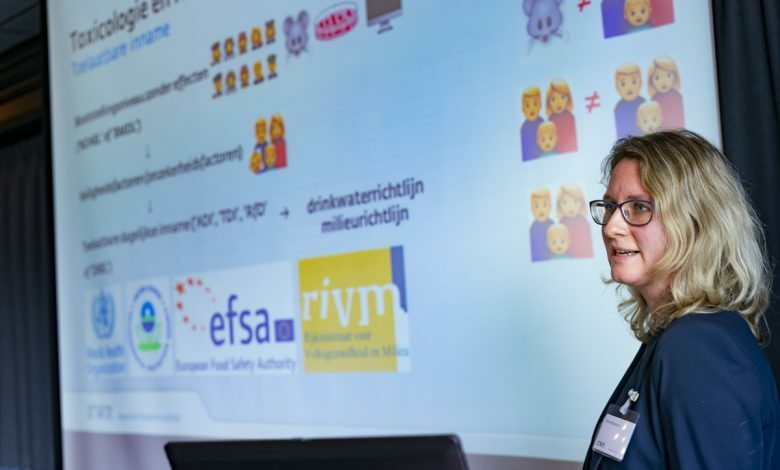 A presentation on the ‘Water Quality Knowledge Impulse programme Toxicity Project’ by Milou Dingemans. Marcel Paalman giving a presentation on the ‘Urban Waterbuffer: balancing water surplus and storage’. The TKI CoRe Water project explained by Kees Roest: ‘From WWTP to sustainable water factory’. 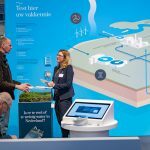 Het bericht KWR demonstrates value added of water knowledge for practice at trade fair verscheen eerst op KWR.